To implement this functionality, you edit the editWishList.php file and create the new file editWish.php . MySQL users: Click + here+ to download the source code that reflects the project state after the previous lesson is completed. Oracle Database users: Click + here+ to download the source code that reflects the project state after the previous lesson is completed. The user logs in, switches to the editWishList.php page, and presses the Add Wish button. The editWish.php page opens, displaying an HTML form. In the HTML form, the user enters a description of a wish and possibly the date by when he/she wants it and presses the Save Changes button. If a form is submitted without a description of the wish, the user is returned to the form to try again. If the user submitted a due date but no description, that date is redisplayed when the form reloads. User interface components, consisting of an HTML form for adding wishes and a button in editWishList.php that redirects the user to the form. Code for redisplaying the due date if an incomplete form is submitted. *Note: *You can ignore warnings from the HTML validator. The form contains an "Add Wish" input field of the submit type. This field implements the "Add Wish" button. When the user clicks Add Wish, they are redirected to the editWish.php page. Because no data is transferred through this form, no Server Request method is used. Add a table above the addNewWish form that displays the existing wishes for the wisher. The code is similar to wishlist.php . Create the editWish.php PHP file in the Source Files folder. Two empty text fields for entering the wish description and due date. The texts to be printed next to the input fields. Upon pressing the Add Wish button, the form submits the entered data to the same page, editWish.php , through the Request method POST. If the user does not fill in a description in the Add Wish form, an error message is displayed and the user returns to the editWish.php page. When the user returns to editWish.php , the Add Wish form should show the value of dueDate if it was entered. In the current implementation of the form, both fields are always empty. To keep entered values, you need to save the data of the new wish in an array. The array will consist of two elements named description and due_date . You then need to change the Add Wish form so it retrieves the value of the dueDate field from the array. *Note: *The code that reloads the input form if no description is entered is included in the code that validates the data and enters it to the database. This code is not described in this section. The code in this section only preserves the value of dueDate so that it is displayed if the form is reloaded . The code checks which Request Server method was used for transferring the data and creates an array named $wish. If the method is POST, which means that the input form is displayed after an unsuccessful attempt to save a wish with an empty description, the elements description and due_date accept the values transferred through POST. If the method is not POST, which means that the input form is displayed for the first time after redirection form the editWishList.php page, the elements description and due_date are empty. In either case the description is empty. The difference is only in the dueDate . Opens the $_SESSION array for retrieving data..
Verifies that the array $_SESSION contains an element with the identifier "user". If the check fails, which means that the user is not logged on, redirects the application to the front index.php page and cancels the PHP processing. To check that session handling works correctly, run the editWish.php file from the IDE. The index.php page opens, because no user has been transferred to the editWish.page through a session. Add two more auxiliary functions to the WishDB class in db.php . One function adds a new record to the wishes table. The other function converts dates into the format that the MySQL databases server supports. Add code to editWish.php that will use the new auxilliary functions in WishDB to enter the new wish into the database. This function requires the wisher’s id, a description of the new wish, and the due date of the wish as the input parameters and enters this data to the database in a new record. The function does not return any values. The code calls the function format_date_for_sql to convert the entered due date into a format that can be processed by the database server. Then the query INSERT INTO wishes (wisher_id, description, due_date) is executed to enter the new wish to the database. Add the function format_date_for_sql to the WishDB class in db.php . The function requires a string with a date as the input parameter. The function returns a date in the format that can be processed by the database server or null if the input string is empty. The function in this example uses the PHP date_parse function. This function works only with English-language dates, such as December 25, 2010, and only Arabic numerals. A professional web site would use a date picker. If the input string is empty, the code returns NULL. Otherwise, the internal date_parse function is called with the $date as the input parameter. The date_parse function returns an array that consists of three elements named $dateParts["year"] , $dateParts["month"] , and $dateParts["day"] . The final output string is constructed of the elements of the $dateParts array. Important: The date_parse function recognizes only English dates. For example, it parses "February 2, 2016" but not "2 Unora, 2016". Note to Oracle Database users: The only format requirement is that the format of the date in the return $dateParts…​ statement matches the date format in the to_date SQL function in the insert_wish query. Now that you have developed the auxiliary functions, add code to validate the new wish data and enter the data to the database if it is valid. If the data is not valid, the code must reload the Add Wish form. If the data is invalid because no description has been entered but there is a due date, the due date is saved and redisplayed when the form reloads, thanks to code you developed earlier. Initializes the $wishDescriptionIsEmpty flag, which will be used later for showing error messages. Checks that the Request method is POST, which means that the data was submitted from the form for entering the wish data on the editWish.php page itself. If the $_POST array contains an element with the "back" key, the Back to the List button was pressed before submitting the form. In this case the code redirects the user to the editWishList.php without saving any data that was entered in the fields and stops PHP processing. If the $POST array _does not contain an element with the "back" key, the data was submitted by pressing the Save Changes button. In this case the code validates whether the wish description is filled in. The code does it by checking whether the element with the "wish" key in the $_POST array is empty and, if the key is empty, changes the $wishDescriptionIsEmpty flag to true. Note that with no further code executed in the PHP block, the Add Wish form reloads. If the Back to the List button was not pressed and the wish description is filled in, the code calls the function insert_wish with the wisher’s id, the description, and the due date for the wish as the input parameters. The code then redirects the user to the editWishList.php page and stops the PHP processing. The error message is displayed if the $wishDescriptionIsEmpty flag is true. The flag is processed during the input form validation. The form redirects the user to the front index.php page upon pressing the Back to Main Page button. Press the Back to Main Page button. The index.php page opens. Logon as Tom and press the Edit My Wish List button again. The editWishList.php page opens. Press the Add Wish button. The editWish.php page opens. Fill in the form. image::images/new-wish.png Press the Back to the List button. 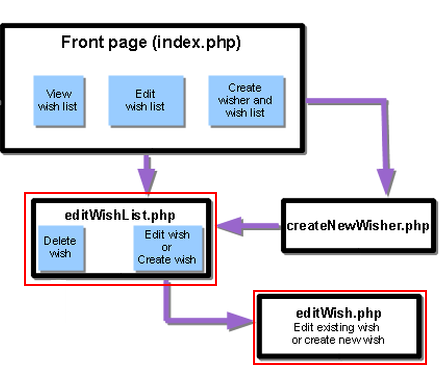 The editWishList.php page opens but the entered wish is not added. Press the Add Wish button again. The editWish.php page opens. Fill in the due date and leave the description empty. Press the Save Changes button. The editWish.php page displays the input form with an error message and filled in due date. MySQL users: Click + here+ to download the source code that reflects the project state after the lesson is completed. Oracle Database users: Click + here+ to download the source code that reflects the project state after the lesson is completed.